With supermarkets and garden centres full of bulbs, it’s nearly time to start planting if you want colour in your garden next spring. Here’s some top tips for planting, courtesy of the Telegraph Gardening section – it includes everything from preparing the soil for best results to forcing bulbs for winter displays. Remove weeds and incorporate lots of compost or other organic matter before planting bulbs. Bulbs grown in pots need good drainage so put plenty of crocks in the bottom and use a well-drained compost. When buying bulbs, reject any that are soft or showing signs of mould. Small bulbs, such as snowdrops, may not flower in their first year – but don’t lose faith! Bulbs should be planted in holes three to four times as deep as the bulb itself. So, for example, a 1in daffodil bulb needs to be planted in a hole 3-4in deep. If you’re unsure which way is the right way up, the advice is to plant the bulb on its side and its stemwill find its own way up. The traditional time to start forcing hyacinths in time for Christmas is the third week of September. Hyacinths will flower 10-12 weeks from potting if kept in a cool, dark room (or under a cardboard box) until they have shoots about 2in tall. Plant labels are indispensable for marking the position of bulbs whose foliage has died back. A discreet wooden label, or a pink or purple coloured one, will prevent the frustration caused by plunging a fork into a border and spearing a clump of your favourite alliums. Most bulbs need dry conditions, but some only thrive in moist soils. In the wild, camassias grow in rich, moist meadows and need similar conditions in the garden. The snakeshead fritillary only flourishes when grown in a damp soil. Eighteenth-century gardeners planted tulips individually, the better to appreciate their beauty. Bulbs planted singly in small terracotta pots and placed in an ordered manner around the garden bring elegance and formality. Squirrels love digging up and eating bulbs. While they don’t eat daffodils, they do have a huge appetite for crocus and tulips. Planting the bulbs deeper than normal can help. Alternatively, plant your bulbs in pots and cover with chicken-wire to deter this pest. 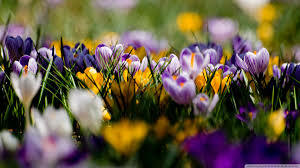 It’s not just crocus that will grow in lawns and short grass. Many miniature irises will be perfectly happy in a lawn that does not become waterlogged. Of the dwarf narcissi, the cyclamineus hybrids are the best adapted to the conditions.Don’t cut the lawn until the bulbs’ foliage has died down. Left in the ground, tulips degenerate each year until they die; lifted, stored and replanted the following November they re-flower well. After flowering, remove the seed head and wait for the foliage to yellow and die back, then lift the bulbs, clean off any soil and store in boxes or net bags in a cool, dry place. Plant pots and windowboxes with no more than two layers of bulbs to prevent later-flowering plants appearing through the dying foliage of earlier ones.